Jason Sturgill is an illustrator based in Portland, Oregon specializing in creating playful iconic images that have character. Before drawing became his full time profession he worked as a graphic designer for Nike SB and Nike 6.0 in both apparel and brand design. He also spent several years at both Wieden+Kennedy and Dark Horse Comics. When he’s not drawing you can usually find him at an estate sale hunting for illustrated ephemera with his wife and son. 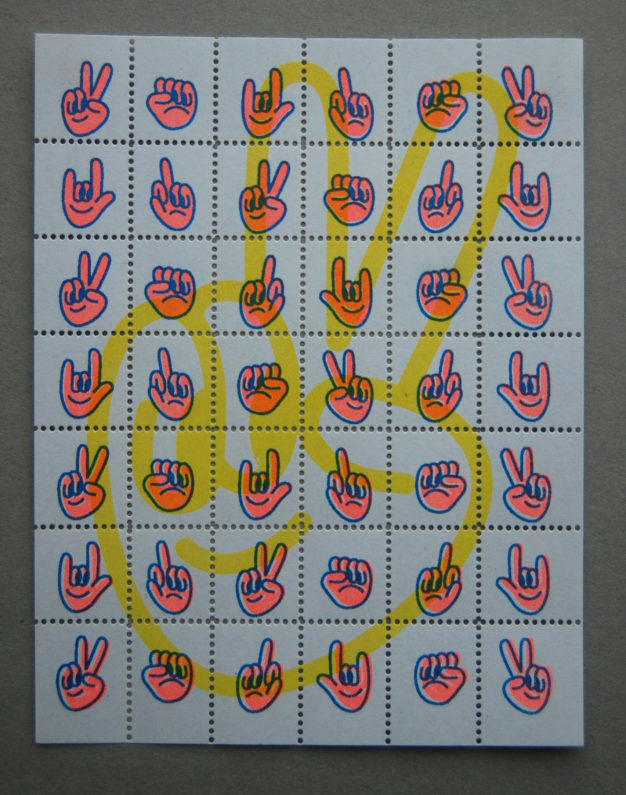 I have not designed a stamp before, but I’ve actually been doing a fair amount of visual research in the aesthetic environment of a perforated cousin of the stamp, the acid blotter sheet. 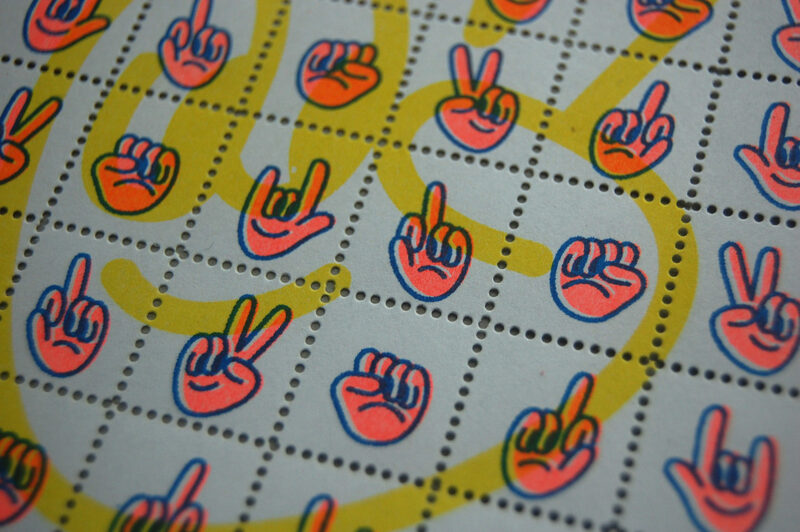 Using the acid blotter sheet for inspiration, I had fun exploring the layering of a single image covering all the singular stamp images. That was main challenge as well, making the sheet work as one overall image but as individual stamps as well. The artwork for the stamps is a continuation of a series I’ve been doing with these expressive hand characters. I’ve had 3 hand characters (peace, love, rock&roll) released as enamel pins with the Portland based company @badge_bomb and this project introduces 2 new characters collectively known as “misunderstanding” alongside peace and love. A lot of my work tries to playfully explore my struggles with mental health in a way that allows for discussion and contemplation.